There's no shorcut for this item, and if you disable the automatic compilation to MO can be very useful. I'm using Poedit 2.2 on macOS 10.12.6. Minor issue, but would be nice to get fixed.
. ... C:\Users\user\Documents\po\bash-4.4.hr C:\Users\user\Documents\po\coreutils-8.30-pre1.hr C:\Users\user\Documents\po\gettext-examples-0.19.4.73.hr ... .
Hello. After I updated Poedit to 2.2 from Manjaro repo, when I double click on a po file, Poedit window opens and crashes immediately. 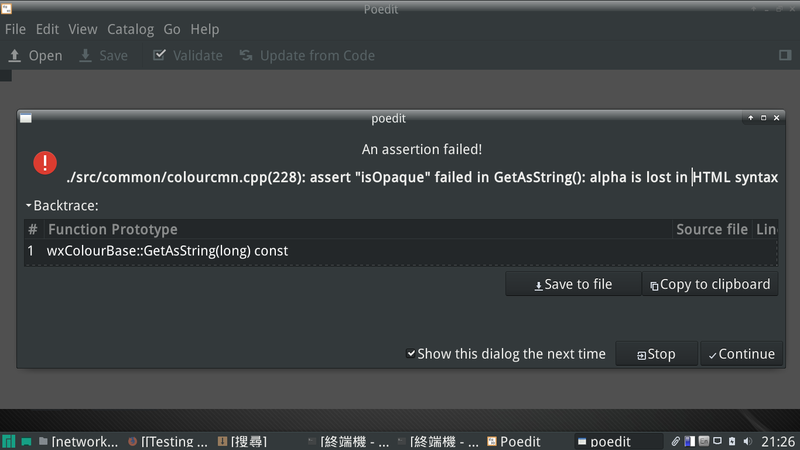 If I start Poedit (from menu), it starts fine but when I open a po file, a dialog is shown that says “An assertion failed!”. Every po file I try has the same result, so I think it is not related to po file.